History for Croatia, heartbreak for England. Croatia will compete in its first World Cup final after putting England to the sword in Moscow with a dramatic extra-time win. 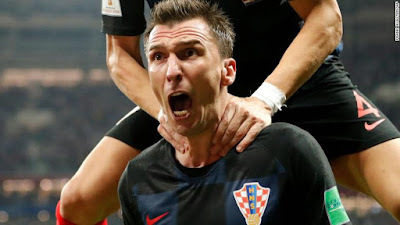 For the third consecutive match, Croatia was forced to play 120 minutes after this semifinal ended 1-1 in normal time. But unlike in victories over Russia and Denmark, it did not need penalties to decide the outcome as Mario Mandzukic's 109th-minute winner proved decisive. Kieran Trippier's first international goal, an exquisite free-kick in the fifth minute, gave England a lead which was negated when Ivan Perisic drew his team level in the second half. Dalic had admitted pre-match that brutal last-16 and quarterfinal matches had impacted his side, but he also said there could be "no excuses." And despite falling behind, his players made sure there wouldn't be as Croatia, a country with a population of just four million - one-13th the size of England's -- and ranked 20th in the world, continued its unexpected journey in Russia. » England vs Italy: World Cup 2014 – live!